Palestine: Where the Disabled Are Not Spared! On the same week, an Israeli court convicted and sentenced a soldier to 9 months in jail for using a “medical device to shock two Palestinian prisoners in the neck.” The court evidence showed that “in both cases the prisoners were handcuffed and blindfolded.” How we came to know of this torture is because the soldier filmed the episode on his phone and his colleagues were heard laughing in the background. The soldier belongs to the ultra-Orthodox Netzah Yehuda Batallion which has had a number of abuse episodes directed at Palestinians in the territories. One judge wrote, “there is no doubt the act” by the soldier “was intended to humiliate” but the two Palestinians were not really harmed “in concrete way.” This judgment was reached without medical examination or testimony from the prisoners themselves. Important to remember that a Palestinian arrested for throwing stones would get sometime 20 years in prison and collective punishment for the family by demolishing their home or confiscating land for the benefit of settlers. Palestinians live under a draconian occupation and the system of justice is administered by the military that occupies and is colonizing their land on a daily basis. The disparity in treatment is directly connected to the over-all structure that exists in the occupied territories. Coming back to Majed, who is seen in the video pleading with the soldiers to call for help for the teenage girl they just shot. But instead, they turn against him. al-Fakhouri provided a detailed account of what happened: “I arrived at the scene to help and rescue the girl, who was fighting death in front of the Israeli border guards… I am a human and I did only what a human is expected to do.” Majed described the steps that led to the soldier’s action stating: “After I had made my way towards her… I spoke with the Israeli border guards, who were insulting people and preventing them from helping the girl, but one of them yelled at me, told me to go home and brutally pushed my wheelchair backwards.” The video shows the wheelchair being flipped upside and Majed’s head hitting the ground. 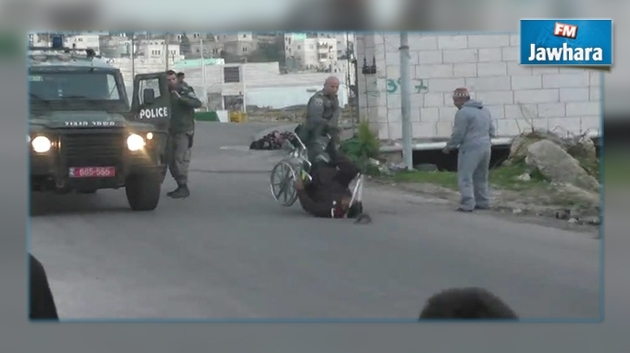 In the video, a group of Palestinians is seen rushing to help Majed but immediately the soldiers raise their guns, one soldier throws a stun grenade while another is seen chasing the crowd away from helping the disabled man. All along 13 year old Yasmin al-Zaro is twisting on the ground in pain and agony while the soldiers not allowing anyone to come close to administer badly needed medical care. The Israeli military report immediately used the “T” word, the all-encompassing “terrorist attack” to defend the soldiers’ action on the scene while describing Palestinians’ response as a riot. Here, the use and abuse of “terrorist” is used as a catchall charge to excuse Israel’s actions against Palestinians and to justify violations of the 4th Geneva Convention as far as treatment of civilian population living under occupation. The assault on Majed and other Palestinians who are disabled is an indication of the political and social shift in Israeli society led by Prime Minister Netanyahu and his rightwing government. What is rapidly emerging in Israeli society and reflected on the ground among the soldiers is a toxic mix of racism and xenophobia toward Palestinians and African immigrants. This has produced a rise in violent and fascistic behavior openly exhibited by settlers in the occupied territories, supported by the military and vitriolic rhetoric by top government leaders including the Prime Minister himself on many occasions. This view was expressed clearly by Udi Aloni, the Israeli director who won the top audience award at Berlin Film Festival, when he called the Israeli government “fascist” while urging Germany to terminate its military support to the state.